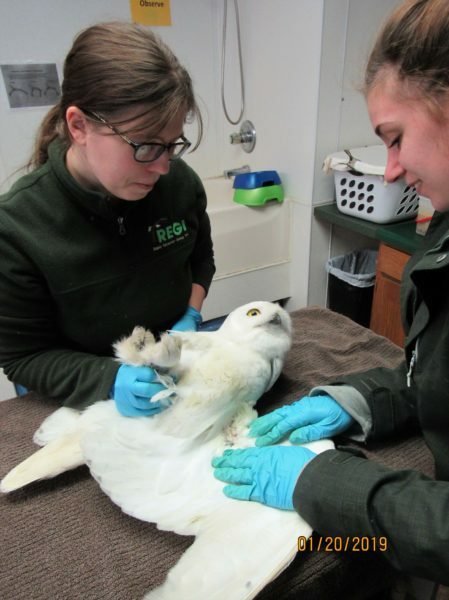 Over the years, we’ve seen snowy owls — both our tagged birds and unmarked owls — get into a variety of problems. 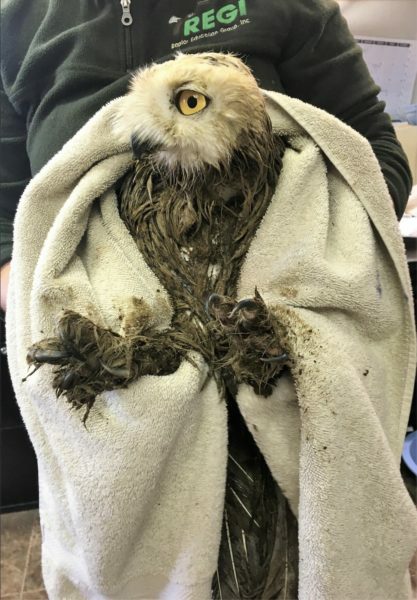 We’ve had tagged owls killed by collisions with vehicles and planes, electrocuted on poorly designed power lines or die from flying into them, drowned by nor’easter storms on the coast, or mangled by the powerful backwash of jet engines. 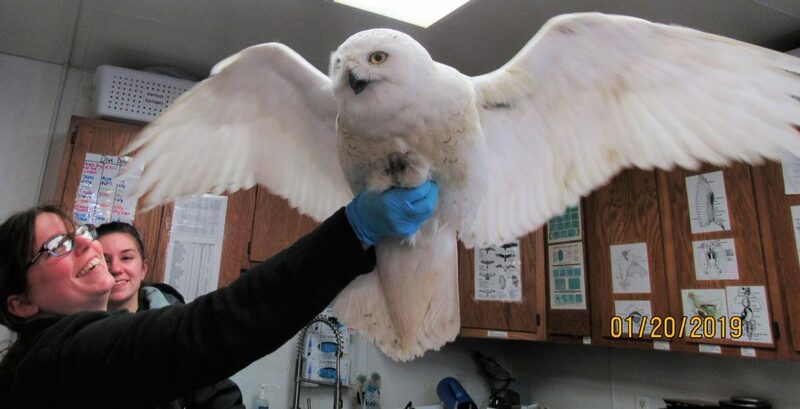 Last winter one owl, Manisses, died from an unusual parasitic infection that killed many other owls on Block Island, RI. But Coddington, who was tagged Jan. 3 on the Buena Vista grasslands of central Wisconsin by Gene Jacobs, got himself into a whole new kind of trouble — at least, new for us, but possibly a growing issue for raptors. Saturday night, Jan. 20, I got a call from Marge Gibson, who runs the Raptor Education Group Inc., a very well-respected raptor rehab center in Antigo, WI. Earlier that day, a snowy owl had been rescued by a farm family from their barn south of Plover, WI — an owl with a transmitter on its back, and with my contact information on the transmitter. It was Coddington, of course, who had been hunting the ag lands and remnant prairie south of Plover since his release three weeks ago. We’d already been a little concerned about him, because he’d been hanging around a large potato-processing factory — and where there are commercial food processing plants, there is often rodenticide being used. But Jan. 17 he flew northeast to the town of Plover itself, stopping for a while at the Crossroads Commons mall, then looped south into what was (at least since we’ve been tracking him) new ground. By Jan. 19, he was hanging around a farm south of the village of Arnott — and probably while chasing prey he ended up inside a large barn with plenty of manure. species of owls in the same predicament, as well as a bald eagle that got into a sewage treatment plant lagoon. Nor is this the first time the Biadasz family has found snowies in their barn. One wing was banged up, and Marge initially feared he might have had a radius or ulna fracture, but his X-rays were clear. Coddington was also somewhat underweight, which probably wasn’t tied to the manure; REGI checked to make sure he hadn’t ingested lead, but we’ll be working with them on more extensive blood toxicology tests. At least at this point, Marge hopes he’ll be back in the wild in a few weeks. 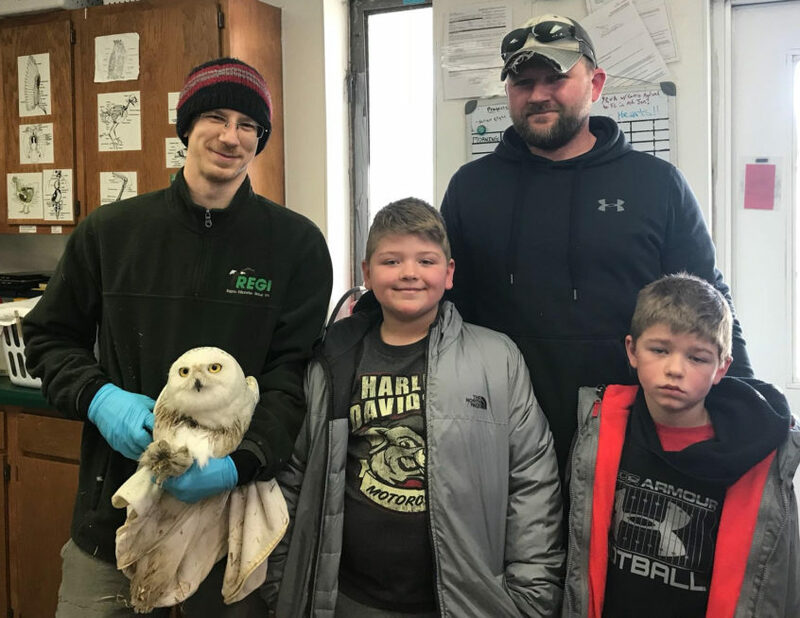 The transmitter, which was funded by Madison Audubon, originally deployed last year on Arlington and refurbished after that owl was killed by a vehicle on his way north, was removed — even if Coddington needs only a short stay at REGI, he’ll do best without any additional burden. Gene Jacobs will try to use the transmitter again — perhaps third time will be the charm. Whenever one of our tagged birds gets into trouble, the bad news is mitigated somewhat by the knowledge that we’re learning more about the spectrum of threats these Arctic birds encounter down here. That’s certainly the case with Coddington, and what may be an unrecognized threat to raptors in general. We’re grateful to the Biadasz family for rescuing Coddington and getting him to REGI, and we’re especially grateful to Marge Gibson and all her small but dedicated staff, not just for their help with Coddington, but for the great work they’ve done for years helping raptors and educating the public. If you’d like to show your gratitude as well, please consider making a donation to the Raptor Education Group, because like us, they’re a nonprofit whose work is supported entirely by donations from the public. OMG, I really feel sorry for the owl with liquid manure mess! It must have been pretty difficult to clean him, too! Curious to know what they used to remove the junk off . So glad to know those birds were rescued and cared for. But I hope they won’t be getting into the same situations again. I hope the other owl is recovering! When Coddington is released, will he have a new transmitter so we can all continue to watch his escapades? I hope so! While it would be nice to continue to track him, we’re unlikely to retag Coddington — the weight loss he showed suggests there’s something else going on with him besides his escapade in the barn. REGI did a test that confirmed he’s not suffering from elevated lead levels, a major problem with raptors, but additional blood work is going to be done in cooperation with Dr. Ellen Bronson at the Maryland Zoo (with whom we cooperate frequently) and our colleagues at the University of Pennsylvania’s New Bolton Center. That will look for other toxins that might explain why he was losing weight. Assuming he bounces back and can be released in a few weeks, it will be without a transmitter (but Coddington is banded, so if he’s ever encountered again we’ll know it). Any possible reason that more than one owl would end up in the same barn, same situation? Is there something the farmer can do to prevent a recurrence? Gene Jacobs, who tagged Coddington, is going to meet with the family to see if there’s something that can prevent a recurrence. But just to be clear, the other manured snowy was found in a different barn. Good work folks! Up here in New England the Maine Great Black Hawk is currently in rehab, having been found on the ground. Last I heard he was in pretty good shape. Thank God for the rehabbers! Oh wow, poor snowies in the manure, must have been very stressing for them. Hope the blood work points to what may be causing Coddington’s weight loss. Great work everyone!